Nancy leathem's Trees and Branches: Honeymoon at Beach Mr. and Mrs. Charles Riggall, nee Lancaster 1952. Honeymoon at Beach Mr. and Mrs. Charles Riggall, nee Lancaster 1952. Mr. and Mrs. Charles Riggall are honeymooning at Surfers Paradise after their Easter Saturday wedding in St. Mark's Church of England, Casino. The bride was formerly Marjorie Lorraine, the only daughter of Mr. and. 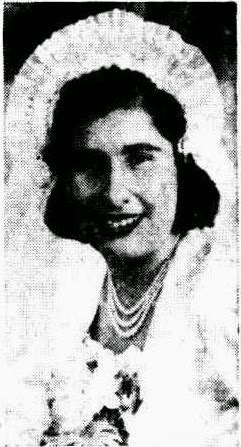 Mrs. J. Lancaster, of Tenterfield Road, via Casino. The groom is the eldest son of Mr. and Mrs. G. Riggall, of Ballina. The portrait neckline and long fitted sleeves were features of Marjorie's satin dress. The skirt fell into a train and had a lace panel down the front. A three tiered curvette of orange blossom held the embroidered tulle veil she carried white charm dahlias and small pink Cecil Brunner roses. Misses Norma Wilkinson and Gloria Child were bridesmaids. Robert Rigall and Clifford Lancaster attended the groom.